JOHOR BARU: Former state executive councillor Datuk Abd Latif Bandi, his eldest son and a property consultant have been charged with a total of 21 counts of money laundering amounting to RM35.78mil in connection with the massive Johor land scandal that broke out in March. The former state Housing and Local Government Committee chairman was charged with 13 counts of money laundering amounting to RM17.59mil. His son Ahmad Fauzan Hatim, 25, and Amir Shariffuddin Abd Raub, 44, were charged with four counts each involving RM735,000 and RM17.46mil respectively. They are said to have committed the offences via cheque transactions at five major banks around Johor Baru between November 2013 and December 2016. Abd Latif, 51, pleaded not guilty to seven counts under Section 4(1) (b) of the Anti-Money Laundering, Anti-Terrorism Financing and Proceeds of Unlawful Activities 2001 (AMLA) (Act 613). If found guilty, he can be sentenced to 15 years in jail and fined five times the amount or RM5mil, whichever is higher. He also claimed trial to six counts under Section 4(1)(a) of the same Act, which carries a jail term of up to five years and a maximum fine of RM5mil, if convicted. Ahmad Fauzan and Amir Sharifuddin also pleaded not guilty to four counts each under the Section 4(1) (b) and Section 4(1)(a) of the same Act, respectively. Sessions Court judge Mohd Fauzi Mohd Nasir set bail at RM500,000 for Abd Latif, RM200,000 for Ahmad Fauzan and RM400,000 for Amir Shariffuddin in one surety each, to run concurrently with previously charged offences. 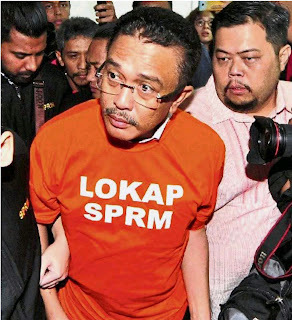 He was referring to the 33 counts of graft that Abd Latif and Amir Shariffuddin had claimed trial to on April 19 for allegedly converting bumiputra lots to non-bumiputra lots involving a total of RM30.3mil in Kota Masai, Tebrau, Kulai, Kempas, Nusajaya and Johor Baru. The judge also fixed July 5 for next mention. Abd Latif and Ahmad Fauzan were represented by a five-man legal team led by Datuk Hasnal Rezua Merican while lawyer Azrul Zulkifli Stork stood for Amir Shariffuddin. The case was prosecuted by Malaysian Anti-Corruption Commission (MACC) DPP Mohd Asnawi Abu Hanifah. Earlier, the three accused arrived clad in orange lockup T-shirts and were escorted by MACC officers into the court at around 8.40am.